It seems that the one thing people are most concerned about when looking to buy a 360 degree camera is the quality of the video. 360 degree video is certainly the stand out feature of any 360 camera and the most likely to impress your friends or customers, but not every 360 camera is made equal. Some of the first 360 cameras were panned by critics because of the very low quality video, however in the last few months several new cameras have been released that claim they deliver HD 360 video. I figure the best way to see if this is true, and to compare the video quality of every 360 camera, is to find examples of video from every 360 camera and put them side by side. If you are more interested in 360 photo’s rather than video, you should be aware that the photo quality of each of these cameras is usually far better than the video quality. This video, from CNET, was filmed in New York and features various scenes around the city with varying lighting conditions. This second Ricoh Theta S example video was shot using a drone and is very impressive! It demonstrates the cameras video quality accurately. This first video, produced by LG themselves, features half a dozen Taekwondo aficionados doing their thing while the camera rolls. The video was recorded outside in very good lighting conditions. The second video was recorded indoors but with good lighting. The maximum resolution of the LG 360 Cam is 1440s, which is equivalent to 2K. The videos are reasonably sharp, particularly outside in bright, natural light and the colors are vibrant. Never the less, the videos are noticeably lower than HD despite the high resolution and the frame rate suffers at the highest quality settings. 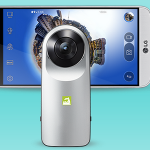 At $200/£200 the LG 360 Cam is one of the cheapest 360 cameras available. This video (taken by me!) was filmed in London during the pride 2016 parade. The video takes you down some of London’s famous streets surrounded by huge crowds. The lighting conditions were excellent however there is quite a lot of movement which effects the frame rate. The second example video was produced by Samsung to show off the video quality of the Gear 360. It was shot indoors and features a troop of ballerinas dancing around the camera. This video demonstrates how the camera handles indoor lighting. The Samsung Gear 360 is capable of shooting 360 video in 4K quality, which is by far the highest yet. You can see the difference in the sharpness and overall higher quality of the videos. Sometimes there is a noticeable drop in smoothness at the highest video quality setting and the stitching is occasionally obvious, never the less this is the closest to HD 360 video we’ve seen so far. The Gear 360 is available for $350/ £330. 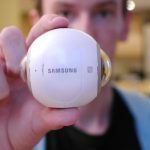 See my full Samsung Gear 360 review here. This video shows some ridiculously adorable puppies playing in a pen. Filmed indoors with the Allie Cam this video shows how the camera deals with fast moving objects and indoor lighting. The second video was also shot indoors because the Allie Cam is designed to be a ‘Home Camera’ that you plug in to a mains supply. This video shows the camera trying to deal with low light. The Allie Cam is also capable of shooting 4K 360 video and is also able to stream video online, a feature not found on other cameras. The 4K quality certainly produces reasonably sharp video, however there is a slight ‘blurriness’ to the video which dulls the overall experience. The Allie Cam retails for $499/£450. These are the main 360 cameras available to buy right now. I’ll leave it up to you to decide which one offers the best video quality for its price, however I implore you to check the full reviews as each camera has distinctive features which you may be interested in. You should also be aware that the way YouTube processes 360 video reduces the quality somewhat, so 360 video may appear to be of higher quality of other video sharing platforms.